Your leading source for high quality bicycles, bicycle parts, accessories, and apparel. Scooter’s Bike Shop has served the Greater Indian Valley since 1975. We have hundreds of bikes in stock to suit every different level of rider and riding style. We also carry a wide assortment of parts, accessories and apparel, including a variety of car racks. If a bicycle or product is not in stock or available, we can order it! Get in touch with us today. Looking for an upgrade, tune-up, repair, custom build or custom bike fitting? We have you covered! Our mechanics have the training and experience necessary to successfully meet all of your bicycle repair needs. We have hundreds of bikes in stock to suit every different level of rider and riding style. Please take a look at our inventory, and if you can’t find what you are looking for, we can order it! 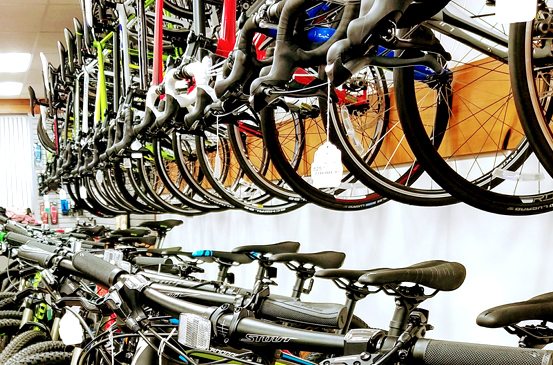 We carry a wide variety of brands for biking accessories, clothing, footwear, and components. Come in and browse the store, and if there is anything you need that we don't have in stock, we will order it for you.